With growing concerns over climate change and the environment, green technology has emerged as a viable alternative to conventional forms of technology used across industrial sectors. Indeed, the development of renewable energy sources has never been more important. Solar photovoltaic (PV) technologies are exhibiting great potential in this field. The rising prices of conventional energy sources and their limited availability have forced industry to turn toward renewable sources of energy, most notably, solar energy. PV cells offer a cost-effective medium to generate electricity from the sun. Silicon-based photovoltaic (PV) cells have been used to tap solar energy since the 1950s. The demand for PV cells has increased in the recent years as a result of growing awareness and demand for renewable sources of energy. However, their low efficiency and high manufacturing cost have compelled the industry to search for alternate and cheaper cells with high conversion efficiencies. According to BCC Research’s The Global Market for Thin Films in Energy Applications (EGY060B), the overall market for thin films was valued at nearly $14.6 billion in 2014, and is projected to reach $84.2 billion in 2020, growing at a remarkable CAGR of 33.7% from 2015 to 2020. Similarly, the global market for thin film PV applications was valued at nearly $12.4 billion in 2014, and will reach $71.1 billion in 2020, growing at a CAGR of 33.6% from 2015 to 2020. The most commonly used PV cells in the industry are crystalline silicon and thin film PV cells. The market is currently dominated by crystalline silicon PV cells but thin film PV cells have also started gaining importance in the industry. Crystalline silicon PV cells have occupied around 80% of the market share to date, but this is expected to fall on account of a shortage of silicon and high manufacturing costs. Crystalline silicon PV cells mainly comprise monocrystalline silicon, polycrystalline silicon and ribbon silicon, while thin film PV cells comprise cadmium telluride (CdTe), copper indium diselenide (CIS), copper indium gallium diselenide (CIGS), amorphous silicon (a-Si) and others. 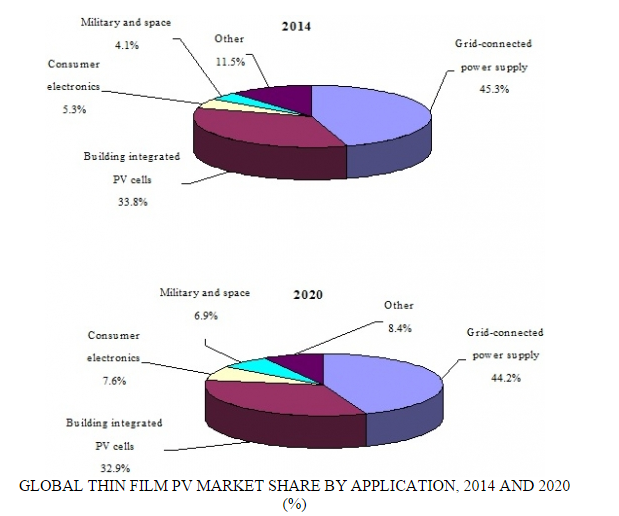 Currently, the thin film market is dominated by building integrated photovoltaic (BIPV) applications. In BIPV applications, CdTe cells occupy the majority of the market as they have a conversion efficiency of 10.7% which makes them suitable for this application. The next most utilized type of cell in BIPV is a-Si, followed by CIS/CIGS. In grid-connected power supply applications, the market for a-Si cells and CdTe cells is approximately the same. CIS/CIGS cells are still at a lower adoption level in this application. Thin film cells are very new in the consumer electronics market, which explains the lower adoption rates compared to building integrated PV and grid-connected power supply applications. In space and military applications, all thin film cell types are in early stage of adoption, as presently this market is mainly dominated by crystalline silicon cells. In other areas such as telecommunications, the adoption rate of thin film cells is low and is expected to rise a little in future. Currently, thin film PV has the largest market share, accounting for more than 80% of the global market share in thin film. There is a need for thin film PV technologies to continuously increase efficiency, which translates to lower system costs coupled with high energy production. Manufacturing costs also need to be brought down in order to achieve competitive pricing. Improvements in conversion efficiency from the current 7% to 14% will increase to 9% to 17% in the next three to four years and is a main area of interest within the industry. Some research labs have registered conversion efficiency as high as 30% to 40% and this has become a new source of interest among the key stakeholders of the market. While the use of thin film PV as an isolated power source in consumer electronics, military and space applications, etc., continues to increase, the market for grid-connected PV cells is also increasing at a healthy pace. Moreover, governments of almost every leading country are encouraging the use of PV cells through a number of initiatives and supports, such as funding for the development of new plants, feed-in tariffs and so on. However, the thin film batteries segment is also expected to witness robust growth due to increasing usage across different application segments. This segment is expected to grow at a CAGR of 34.2% from 2015 to 2020. In addition, the nuclear sector is also expected to see significant growth, again due to the increasing usage of thin films across this sector.